How many times must the truth be told before it conquers the lies? I call that "a wrong question", because no answer is possible. Wrong questions are everywhere: How many grains of sand are there in the Sahara? How many drops of water are there in the Pacific? How many stars are there in the sky? These are all wrong questions because none of them can be answered, but they can still point us toward knowledge. So even though they're wrong, they're not useless. We just have to look for related questions that can be answered. The point of the rhetorical question Chris posed is this: Why does it take so much truth to make certain lies go away? And why do other lies seem to last forever? Conversely, what sort of truth has the best chance to conquer the lies? Just a few days ago we were discussing a mind-bending piece from the amazing Washington Post columnist, Shankar Vedantam, in which he seemed to have trouble distinguishing between "where" and "when", a blunder he compounded by using "or" instead of "and". Fortunately for Shankar Vedantam, he was unopposed -- playing chess against an inflatable doll, so to speak -- so these two colossal blunders didn't finish him off. Instead he carried on in this manner until he somehow managed to conclude that the surge in Iraq will work, if it goes according to "conventional mathematics". There was no Al-Q'aeda in Iraq before September 11th; in fact Saddam Hussein and Osama bin Laden were enemies. Al-Q'aeda ... Iraq ... September 11 ... Saddam Hussein ... Osama bin Laden. Do you believe this? I can think of other examples that would corroborate it. I've taught math. I've seen my students make the same mistakes over and over even though I repeatedly told them otherwise, and showed them how it should be done. But the number of students who forgot within three days was nowhere near 28%. More like 1%. Experiments by Ruth Mayo, a cognitive social psychologist at Hebrew University in Jerusalem, also found that for a substantial chunk of people, the "negation tag" of a denial falls off with time. Mayo's findings were published in the Journal of Experimental Social Psychology in 2004. "If someone says, 'I did not harass her,' I associate the idea of harassment with this person," said Mayo, explaining why people who are accused of something but are later proved innocent find their reputations remain tarnished. "Even if he is innocent, this is what is activated when I hear this person's name again. Mayo found that rather than deny a false claim, it is better to make a completely new assertion that makes no reference to the original myth. Is this research directly relevant? Perhaps. I believe there's a big difference between a suspect denying his own role in a crime -- "I did not harass her" -- and a neutral party denying a verifiably false assertion -- "Slovenia is not just another word for Slovakia". But I can see how a different sort of statement -- "Slovenia and Slovakia are two different countries" -- might stay clearer in the students' minds longer. As early as 1945, psychologists Floyd Allport and Milton Lepkin found that the more often people heard false wartime rumors, the more likely they were to believe them. The experiments also highlight the difference between asking people whether they still believe a falsehood immediately after giving them the correct information, and asking them a few days later. Long-term memories matter most in public health campaigns or political ones, and they are the most susceptible to the bias of thinking that well-recalled false information is true. What is this? Shankar Vedantam making sense? Apparently he his; I'll explain later. Many easily remembered things, in fact, such as one's birthday or a pet's name, are indeed true. But someone trying to manipulate public opinion can take advantage of this aspect of brain functioning. In politics and elsewhere, this means that whoever makes the first assertion about something has a large advantage over everyone who denies it later. One of the great secrets of propagandists: get there first with the lie, and the truth will have a tough time following. a new experiment by Kimberlee Weaver at Virginia Polytechnic Institute and others shows that hearing the same thing over and over again from one source can have the same effect as hearing that thing from many different people -- the brain gets tricked into thinking it has heard a piece of information from multiple, independent sources, even when it has not. Weaver's study was published this year in the Journal of Personality and Social Psychology. The experiments by Weaver, Schwarz and others illustrate another basic property of the mind -- it is not good at remembering when and where a person first learned something. People are not good at keeping track of which information came from credible sources and which came from less trustworthy ones, or even remembering that some information came from the same untrustworthy source over and over again. Here Shankar Vedantam is saying that myths are most easily established if they arrive early and are repeated often, even if all the repetition comes from the same source, and even if that source has been shown to be untrustworthy. Do people really want to believe myths for their own reasons? 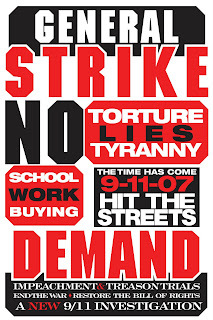 This reminds me of another Shankar Vedantam column I've read this week, "Study Ties Political Leanings to Hidden Biases" (mirrored here), in which Shankar Vedantam reports -- in the gentlest mainstream terms possible -- on a study that finally reveals a shocking truth about America: white racists tend to vote Republican! Now put two and two and two together with me, will you? White racist Republicans who want to believe the myth for their own reasons and who hear lies supporting that myth constantly -- even from a discredited source -- would be extremely difficult to convince of anything. For instance, it might be difficult for such people to suspect a white person of a crime when a darker suspect is readily available. President Bush's job-approval rating among African Americans has dropped to 2 percent, according to a new NBC/Wall Street Journal poll. A few months after the 9/11 terrorist attacks, the NBC/Wall Street Journal poll found Bush's approval rating among blacks at 51 percent. This was when Bush's approval rating was in the nineties among the country at large -- or so we were told at the time. But I'm sure none of this has anything to do with anything we're talking about here. The Washington Post reports this morning that "many in the Arab world are convinced that the destruction of the World Trade Center on Sept. 11 was not the work of Arab terrorists but was a controlled demolition; that 4,000 Jews working there had been warned to stay home that day; and that the Pentagon was struck by a missile rather than a plane." A report last year by the Pew Global Attitudes Project "found that the number of Muslims worldwide who do not believe that Arabs carried out the Sept. 11 attacks is soaring -- to 59 percent of Turks and Egyptians, 65 percent of Indonesians, 53 percent of Jordanians, 41 percent of Pakistanis and even 56 percent of British Muslims." 51% of Americans Want Congress to Probe Bush/Cheney Regarding 9/11 Attacks. 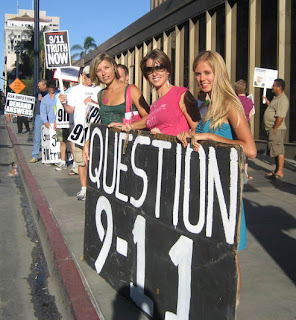 One particularly nagging question for 9/11 Truth activists runs like this: "How can we make that number bigger, faster?" In the column we mentioned earlier this week, we liked Shankar Vedantam's presentation of the data he was getting; it was the spin that we found annoying. And this column is just the same. Big surprise: The liberal media is slipping another shiv between your ribs! he attributes the success of the propaganda to the style in which it has been debunked. But the new psychological studies show that denials and clarifications, for all their intuitive appeal, can paradoxically contribute to the resiliency of popular myths. And therefore, he concludes, the "myths" about 9/11 are equally durable, and for the same reasons. I agree with him entirely. We just don't agree on what the myths are! 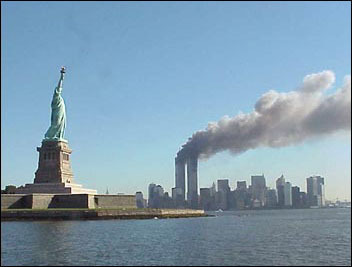 Similarly, many in the Arab world are convinced that the destruction of the World Trade Center on Sept. 11 was not the work of Arab terrorists but was a controlled demolition; that 4,000 Jews working there had been warned to stay home that day; and that the Pentagon was struck by a missile rather than a plane. Isn't this interesting? Even the vaunted State Department's propaganda machine cannot stem the tide of truth! And it's no wonder, really, considering how chock-full-o-holes the official story is. Mayo found that rather than deny a false claim, it is better to make a completely new assertion that makes no reference to the original myth. Rather than say, as Sen. Mary Landrieu (D-La.) recently did during a marathon congressional debate, that "Saddam Hussein did not attack the United States; Osama bin Laden did," Mayo said it would be better to say something like, "Osama bin Laden was the only person responsible for the Sept. 11 attacks" -- and not mention Hussein at all. Ain't that beautiful?? At least she doesn't believe it completely. Not entirely? No, not quite! Is it possible to use lies to "refute" the truth? or can lies only be used to "refute" other lies? Surely that depends on the inherent consistency if the lie, and how well it is corroboated by known facts. But maybe it also depends on how the lies are dismantled, and how the truth is told. And here's the interesting thing: Even though the lies continue to resonate, especially among the unreachable Americans who believe whatever they want to believe for their own reasons, the truth -- about our global nightmare and the event that triggered it -- is still spreading. We must be doing something right. Actually we are doing a lot of things right. But one thing is clear, even amid the manure thrown around by the spinning Shankar Vedantam. We cannot simply deny the lie: we have to tell a more convincing truth. And this leads me to my final point. There's a big difference between proving that an assertion is untrue and simply denying it. Just because something has been denied, that doesn't make it false. People in full-spectrum denial, like the folks at Screw Loose Change, and the creators of the 9/11 fiction emanating from Popular Mechanics, and even some so-called truth-seekers in the so-called 9/11 Truth movement, blur that distinction. And most often, when you see somebody saying "That's been debunked", it merely means it's been denied. All the official myths about 9/11 have been refuted. The refutations have all been denied, but they have never been debunked, nor can they be, for you cannot debunk the truth. It may be just as important to understand this distinction as it is to know the "facts" about what went on that day. The manner in which you present your argument makes more difference than you may think. But so does the content. If you tell people the truth, in a calm and reasoned way, they will have no trouble believing you! Meanwhile ... What are you doing on September 11th?